Crosswhatfields? : Shocking new pollution results for Deptford! Shocking new pollution results for Deptford! 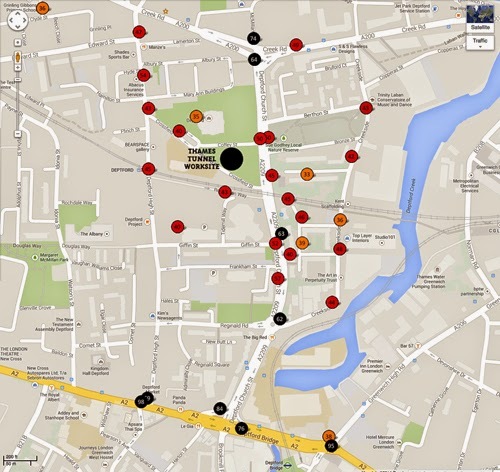 This is a screenshot of the online map that displays the results of a Citizen Science Air Pollution Survey carried out earlier this year by local residents (see our previous post). The results are now published. View the full results for Deptford here. 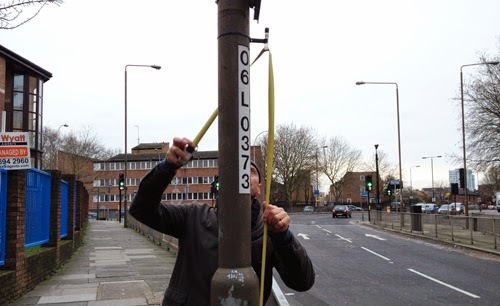 The survey measured Nitrogen Dioxide (NO2) levels only (it is too expensive to monitor carbon particulates), and the results show extremely dangerous and illegal levels on Deptford Church Street, Creek Road, Deptford Broadway and New Cross Road. The black dots are readings of over 60µg/m³ (micrograms per cubic metre). The red dots show readings between 40 and 60µg/m³. The EU legal limit is 40µg/m³. Crossfields Estate itself has readings as high as 46µg/m³ inside the estate. 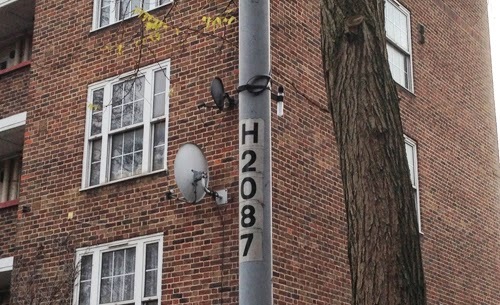 Higher readings were found on the estate near both Deptford Church Street and at Creekside. Opposite Wilshaw and Holden on Creekside the reading was 48µg/m³. At the Birds Nest roundabout it was 62µg/m³ and on the Crossfields side of Church Street at the crossing to Giffin Street it was 63µg/m³. Deptford High Street had much higher readings than expected (as high as 54µg/m³), but most of the over 60µg/m³ readings were at both ends of Deptford Church Street (84µg/m³ at Deptford Broadway) and the south end of Deptford High Street (69µg/m³). Levels immediately increase on New Cross Road – the junction at Amersham Vale gave readings of 110µg/m³! Students at Goldsmiths College are exposed to extremely high levels, whilst our local schools do not fare very well either: 98µg/m³ at Addey & Stanhope, 68µg/m³ at Deptford Park, 62µg/m³ at Deptford Green, 56µg/m³ at St Alfeges, 55µg/m³ at Clyde Early Childhood Centre, and 40µg/m³ at Tidemill and St Joseph's. Back in January, four Crossfields residents teamed up with four other local residents and the Don't Dump on Deptford's Heart campaign to conduct the survey in Deptford. They worked with the No to Silvertown campaign and the Network for Clean Air to produce a survey that covers five local boroughs. See the combined boroughs map on the Silvertown website. It shows that even Lewisham is not safe. A tube placed almost at the entrance to Lewisham market gave a reading of 109µg/m³ ! 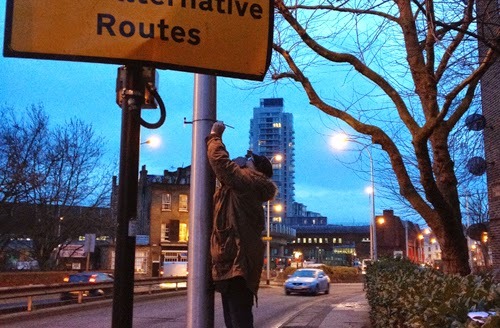 Diffusion tubes were put up on lamposts in the week commencing January 6th and taken down in the week of February 3rd. Under the direction of the Network for Clean Air, the tubes were then sent to a lab. Unfortunately, the results took two months to process, so were too late to use as evidence in two grass roots Deptford campaigns against Thames Tunnel and Convoys Wharf. The consultation conducted by the Planning Inspectorate on Thames Water's plans to site a shaft on Deptford Church Street closed on March 12th. However, the Citizen Science Pollution Survey results have been submitted to them and will accompany the Inspectorate's recommendation to the Secretary of State on June 12th. The Don't Dump on Deptford's Heart campaign are arguing that Thames Water should revert to their original choice for a shaft site on the river at Glashier Street – where the survey measured very low pollution levels of 14µg/m³. At this site, spoil could be transported by river and there would be no need to partially close Deptford Church Street for over a year that would cause gridlocked traffic to divert onto Creekside and Deptford High Street. If Thames Water's plans succeed, there will be 17400 extra HGVs using their site on Church Street for over three years. These will be in addition to the 90 HGVs per day that will be using Creekside when the Faircharm redevelopment begins. And now that Convoys Wharf has got the go ahead, there will be hundreds of HGVs pouring into and out of Evelyn Street and heading for the A2 via Deptford Church Street. The results show our area is already highly (and illegally) polluted. These Deptford construction projects have the unique advantage of being able to access the river directly. The Creekside redevelopments could be using Deptford Creek. 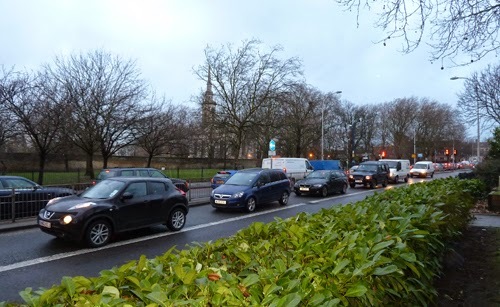 Lewisham Planners should force the Creekside developers to use the Creek, whilst ongoing discussions between them and GLA Planners over the transport plans for Convoys must make it an absolute condition for the developer to use the river and not our local roads. In addition, Boris Johnson needs to speed up the conversion of our highly polluting buses to hybrid models, a former pledge he has fallen way behind on. The Network for Clean Air wants the Mayor of London to bring forward the start date of the proposed Ultra Low Emission Zone, extending it to include Greenwich and Lewisham. That presumably would include taxis as well. Find more detail and information at the No To Silvertown website. The Don't Dump on Deptford's Heart study was funded by the residents who took part plus a generous donation from Deptford First via Dame Joan Ruddock MP. So let me get this right, you want to turn the only green spot on the map into a red spot. Thank you very much for dumping your pollution onto someone else. Anonymous, you might have missed the point. Whilst the alternative Thames Water site means the green spot might turn orange, the present reality is that the red spots WILL turn black. Even if the riverside site were used, TW still propose to run hundreds of HGVs up Deptford Church St to the A2. The argument is that they should use the river and not use the roads at all. Hear hear. The GREEN on Deptford Church Street that should actually be a green dot is NOT. It is red, above the legal limit. The green DOT at the Ahoy Centre is because it is by the river, not because there is any green there. That is why the housing there are premium spaces and cost twice as much, though most people think it's because of the 'view'. Yet the sewage problem is exacerbated by building more new premium units by the river. As is the pollution problem – with a 10-year construction period for Convoys Wharf! What's more the Convoys Wharf development will benefit from cheaper energy from SELCHP. This energy transfer station is probably responsible for most of the general pollution in the area after the roads. And the last thing the premium home owners by the river want is for the river to be used for the benefit of all. Eg, as a working waterway that transports goods, materials and spoil instead of using our roads. If done right using the tides, this mode of transport doesn't require the same amount of polluting power that is currently used by Clippers etc that are timetable bound. But of course it has implications for those (now) quiet riverside developments.